The Roto eNewsletter and Roto eBulletin provides periodic updates from Roto North America on new products, product updates, Roto people, and events. Use the the form on this page if you would like to become a Roto e-Newsletter and Roto eBulletin subscriber. The Roto Inside newsletter, produced by Roto AG, contains the most recent global-scale news and developments from around the Roto World. 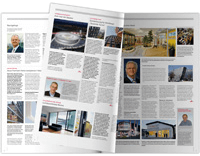 View the latest editions of Roto Inside below.